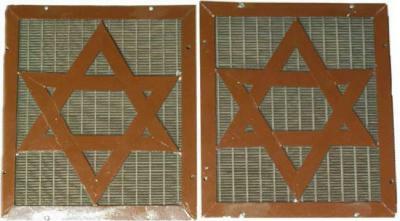 Star of David motif; Green star and time trim on metal green background. These sreens were used at the building of Beth Jacob Congregation, in Price Hill. Beth Jacob Congregation of Price Hill announced the imminent completion of its new synagogue and Hebrew School, located at 3770 St. Laurence and Rapid Run Avenues, opposite Kirbert Avenue, on February 21, 1925. The building consisted of two stories: the first level made up of classrooms and an auditorium “for gymnasium work and for dancing”, the second story to be used as a synagogue. The building still stands at the corner of St. Lawrence and Rapid Run Avenues in Price Hill. Its Hebrew name is still visible in the masonry above the entrance doors.